IMPORTANT NOTE: For all intents and purposes, the two "main characters" of the comics are the newcomers, Duck-Girl and Bunny-Girl. The others are all relevant and *can* be included in any work, but none of them would be used as the focal characters in a match. They are important to DG/BG and will appear from time to time, thus they had to be included in the Profile, so I apologize for any confusion. Skills: Duck-Girl is very capable in hand-to-hand combat, highly-skilled in several forms of the more disciplined martial arts but typically just brawls. She shows general prowess for most criminal activities; particularly driving and gambling. Personality: Usually pretty grumpy and sarcastic, Duck-girl is full of attitude. In a bar fight she is almost always the first to throw a punch. Her short temper is countered only by the sense of humor that accompanies it, even if that usually means somebody is being picked on. Also: Duck-Girl is a smoker and heavy drinker. She calls her matching pair of steel-knuckles her Wings. Despite frequent pestering, she will never divulge the origin of her hat (she actually made it herself, but her fashion-design skills are a terrible embarrassment). Skills: Also a skilled fighter, Bunny-Girl is another jack-of-all-trades. She's an especially talented con-artist, using her cuter demeanor to mask her criminal intentions. Personality: Bunny-Girl tends to come off a little air-headed, but it's mostly an act to cover up her quick-thinking and very witty thought-process. She's very cheerful and friendly, but very serious when she needs to be. Also: Bunny-Girl is super into karaoke and musical theatre, but a terrible singer. She recently lost her original pink pullover bunny-hoodie to Florence Ailey (watch who you're pickpocketing! ), but has replaced it with another rabbit-themed zip up. Animal Girl Criminal Squad (AGCS): A small and mysterious group of professional criminals, working together to pull jobs of varying size and scope; from involved and risky bank-vault heists and political extortion to simpler jewelry store robberies and con-jobs. Each member specializes in different roles, and are brought into the group on an invitation-only basis. The group is led by the mysterious "Boss-Lady", who communicates through messages to the girls at their Top Secret Headquarters (the Top Secret HQ acts as a home for the members, but also houses a gym, communication room, etc); usually the details of the different jobs are left to the co-leaders Fox-Girl and Reindeer-Girl, but can sometimes be more specific. The girls all have real names, but typically use their codenames when talking to/about eachother. They work for no other organization, and do not operate contractually under any conditions; if this were D&D or something like that they would all be considered Chaotic Neutral, with no allegiances except for to Boss-Lady, themselves and the Squad. As a rule the group utilizes their sexual appeal, and use their animal-theme to appear less-threatening in order to coax their enemies into a false state of comfort. These are no damsels-in-distress however; they are incredibly capable and very successful criminals, having operated within Void City for generations. Skills: Exceptional Con-Artist, Reindeer-Girl usually fills the role of the Inside Man in a job that requires it. She also serves as the group's driver, and has many underground and criminal contacts. 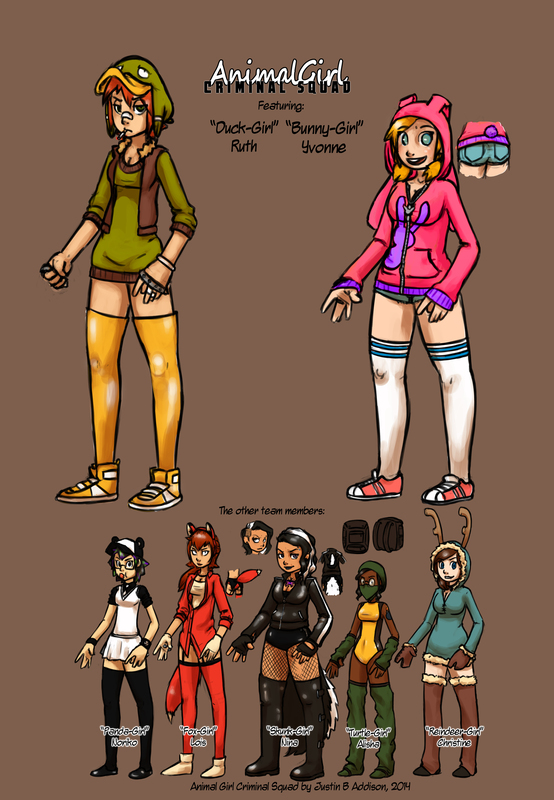 Personality: Reindeer-Girl is one of the group's Co-Leader, and is very level-headed. She is very stoic and motivated, as well as supportive (even motherly at times, when the other girls need it). Also: Reindeer-Girl cooks for the group, and is often found tidying the others' rooms. Skills: Fox-Girl is an accomplished master-thief, whose skills mostly lie in safe-cracking and general lockpicking, stealth, and general acrobatic physical stunts. She is also trained in jujitsu. Personality: Hot-headed and sassy, Fox-Girl can almost seem cruel to those who don't know her. Being the other co-leader, however, she is also a very strong leader that, while being radically demanding, inspires the group to do their best at all times. Also: Lois and Christine both joined the AGCS at the same time, and were briefly romantically involved. It ended but they're cool now. Hair: Black, with vibrant purple and green highlights. Skills: Panda-Girl is the team's resident tech-guru. She is a highly-skilled hacker and coder, and also a talented engineer and electrician, whose wiring skills are only matched by Turtle-Girl. Personality: Panda-Girl is very chipper, and is rarely seen away from her computer. She takes great pride in her capabilities and is always excited to show off her latest invention or discovery. She is also a HUGE nerd, and when she's not working on a project, is watching her tv shows or perusing their respective forums. Also: Panda-Girl chews bubble gum very frequently, and has a bad habit of sticking old wads of it to any convenient surface. Skills: Skunk-Girl is the group's Tank. She's very strong and an incredible fighter, having once been a student of a Muay Thai master. Personality: Skunk-Girl is all about fun; and unfortunately for most others, to her fighting is the most fun of all. She is excited by the thrill of danger, and is usually pretty vocal about it. She is very friendly, but also has a tendency to pretty excessively flirty (Skunk-Girl is without a doubt a womanizer). Also: Skunk-Girl is an *incredible* dancer. She is also the only member that can out-drink Duck-Girl. Skills: An explosives- and arson-enthusiast, Turtle-Girl enjoys creating ways to blow things up or set them on fire more than basically anything, to an almost obsessive degree. There's no explosive compound that she isn't thoroughly-knowledgeable in, and no chemical reaction that will set something on fire that she can't create. As a result of her other skills, she is also talented at wiring and electronics. Personality: Turtle-Girl is incredibly reserved. She's not shy, but doesn't talk much unless it's directly related to something being blown up and/or set on fire. Also: Turtle-Girl's backpack is filled with various gadgets/components for explosives, etc, but is also well-stocked with food and drink (as well as packup bandannas should something happen to the one she's wearing. Nothing ever has but when you work in arson you can never be too careful).